I thought it was time I did an update on my very own Fiddle Leaf Fig, after bringing it home from the nursery 18 months ago. My FLF was the first indoor plant I bought, which has since sent me on a downward spiral in an addiction to greenery! Haha! Here’s the Latest on my Fiddle Leaf Fig – Fertilizing, Staking, Spider Mites and Repotting. The first thing I did in October was to repot my Fiddle Leaf Fig. As I’m based in Australia, this means it was mid-Spring. Plant pots are expensive, and I had been eying off one in particular that I ended up getting for my birthday. I used about a 5:1:1 ratio of quality potting mix, perlite and peat moss to repot it. The reason for this was partly because of my research into what FLFs need, and partly due to what was available in my area… In saying that, I don’t think there’s only one right mix to use, if you as long as you’ve got a quality potting mix that will allow water to drain instead of sit, you’re on the right track. Generally its best to rid the roots of the old dirt, so it will sit in fresh new potting soil. Also, with a bigger pot comes more water! While I used to only give it a cup of water each week, I now do about 500mL or so (except for when I fertilize, which is more). Its always best to fully saturate the soil when watering to flush out any buildup of salts. My FLF 18 months ago compared to now: repotted and lots of growth! As my Fiddle Leaf Fig growth had seemed to slow a bit, I knew that once the weather warmed up I would like to start fertilizing it. I once heard it explained like this: Fertilizer isn’t a magic growth hack, but it will top up the plant’s nutrients so that it has everything that it needs for the best possible growth. Think of it like a multivitamin. However, when first started fertilizing my FLF, I had some AMAZING results! As far as fertilizers go, the best type for FLFs is any that has a ratio as close to 3:1:2 as possible (Nitrogen – Phosphorus – Potassium). The fertilizer will state this on the product label. 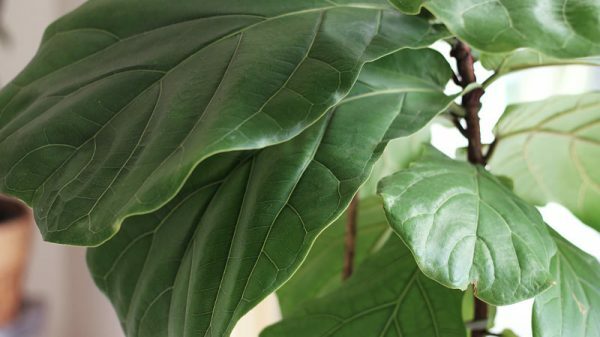 This Botanicare GROW fertilizer is the perfect ratio of ingredients for Fiddle Leaf Figs, encouraging full foliage and new growth. I’ve been using fertilizer in a monthly water, and after the first time I used it, I got a growth spurt of three new leaves that were literally more than DOUBLE the size of any other leaf! I’ve since written a more detailed post on Fertilizing FLFs and how I got such amazing new growth. Recently I took my FLF outside for a big water on a breezy day. Because of this, and because its now a bit top heavy with those new giant leaves, it started to lean for the first time. Once I brought it inside, I poked a wooden stake in the outer edge of the pot and tied the trunk to it with some string to help keep it straight. It is probably better to use rags or cloth over string, but it isn’t too tight so should handle it ok. After about six months I’ll untie it to see if it still needs to be staked or not. Staking has the potential to stop the roots spreading as the tree no longer relies on the roots to to support itself, which is why you shouldn’t stake a plant forever. As mine is an indoor plant, I don’t think its as much of an issue, although I’ll still check it and would rather not have the stakes in the pot. If your FLF is leaning or needs staking, check out this post which has some great tips to get the trunk to grow thicker and stronger more naturally. In the last month or so, I started noticing some lighter discolouration on some of the lower leaves of my FLF, combined with some tiny egg-like white dots along the spines of the leaves (top and bottom sides). After much Googling and analyzing my Fiddle Leaf Fig, I came to the conclusion it must be Spider Mites! They are teeny tiny spider-like mites that are barely viewable with the naked eye. In bright daylight I could just make out a few spider-like moving dots, and some very small webs where the leaf stems meet the trunk. The first thing you can do is to continue to wipe down the leaves on both sides with a damp cloth. This removes the eggs and mites (the mites left an orangey-brown tinge on the cloth). I did this almost daily for a few weeks. Keep at it so that any if eggs that you miss do hatch, you will get them next time! After doing some research, I also sprayed all the leaves down with an Organic Neem Oil and water mix, which is meant to ‘suffocate’ or give a barrier between the mites and the plant. I’m not exactly sure how effective this was – I have a feeling it was mostly the wipe-downs that got rid of the spider mites. You can also hose down the leaves instead of wiping, which will push off the mites and their eggs. If you get a spider mite infestation, it is fairly easy to take action on, you just have to stick to the regime until they are all gone! If you need any more advice or info on your Fiddle Leaf Fig or you are noticing that your Fiddle Leaf Fig has Leaf Damage, check out my other posts- Growing and Pruning Your Fiddle Leaf Fig, and How to Grow a Fiddle Leaf Fig from Bush to Tree. Or if you have any questions on fertilizing, staking, spider mites and repotting (or anything else! ), feel free to leave a comment below and I’ll get back to you! Find me on Bloglovin’ – I’d love your support! Hey Lauren! The best way to water a FLF is to fully saturate it every time you water, until the excess runs out the bottom. FLFs like a lot of water, less often. Doing this makes sure that all the roots get watered evenly. When you do this method, it might mean watering it less often, as it will take longer for the soil to dry out. You can either take it outside, put it in a sink or just add a tray underneath to catch the water. Saturating the soil also helps flush out any buildup of salts or nasties that can accumulate in the soil. The best way to check when it’s ready to be watered again is to see if the top two inches of soil are mostly dry. This (generally) happens every 7-10 days but may be longer during the cooler months. I find it’s easiest to add liquid fertilizer into the water when I water mine so that again, all the roots get covered. Doing the above is a lot healthier than giving them a measured amount of water at a certain time. Saturating them when you water means that any previous fertilizer may get flushed out, but this is a good thing – again, to remove any buildup that can sit in the soil. If we fertilize our FLFs monthly for example, imagine how much build up of fertilizer there would be in the soil after a year, if the soil never gets flushed! The water eventually gets absorbed or dries out but excess fertilizer & chemicals from tap water will sit in the soil. This can lead to harming the plant or causing chemical burn. Thank you Emily, I’ll give it a good saturating this weekend. I also noticed a small amount of spider mites so I’ve given it a good wipe over with a damp cloth and will keep a close eye on that too. Thanks for your reply. I’m sure I’ll be seeking further advice in the future. I just purchased a baby 6-inch FLF, when would you recommend starting to fertilize it? After reading this post, you started to fertilize it after a year, would you recommend doing the same or could I begin fertilizing it now? P.S. I love your blog and have read every single one of your FLF post, going to move on to all your greenery post now too! So informative, and fun to read. Hey Vivian, you can start fertilizing any time! I only started a year in because I didn’t think of it before then… You only need to make sure you’re mixing it up according to the instructions. They are generally quite potent mixes and you shouldn’t need to use a lot. Hi Emily, I recently purchased a stunning and lush Fiddle Fig and I was looking for the fertiliser you mentioned but I can’t seem to find it stocked in any of the nurseries in Melbourne or even online in Australia. I was wondering if you are able to tell me where you purchased the Dyna-Gro Foliage Pro from please? Thanks for that Emily. I did find that site as well but thought before I order it I should find out that if you got it locally I should try that first. 🙂 I am off to place my order now. Thanks so much. Great comments, whilst on Pinterest I read if you carefully lift a leaf off and place it in water roots will grow and yes a new plant, it has worked for me, so good luck, I chose the smaller leaves near the base of the plant. Have just purchased my fiddle leaf fig about 2weeks and am loving it it took me awhile to find one,im an aussie too and enjoyed your update thank you . Oh thanks for your comment Colleen 🙂 I find it is harder to find info about them in Australia! So I’m glad you enjoyed the post. I think they do grow well here though! Enjoy your new FLF! 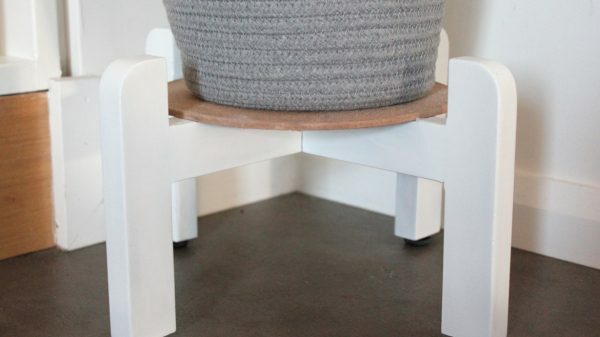 Hi Susie, see how you go with your FLF in its new position. Normally leaves browning is environmental – if it’s too dry, or in the way of air con, or too much direct sun, or possibly not enough water. As it’s summer here in Aus you could definitely apply a fertiliser – they basically are like multivitamins for the plant, giving it any nutrients it may be missing for proper growth. I hope that helps. Glad your FLFig is doing so well. Mine is now touching the ceiling so I am going to need to find out how to prune it so that it, a. Doesn’t die ..and b. Still looks pretty. Wondering also if the pruned stem can be rooted to form a new plant?? ?